There's a reason modern journalists are using lists as headlines in many article headlines today. There's something about lists that satisfy the human brain and give us a sense of satisfaction. If you're one who often feels overwhelmed by the number of tasks to accomplish each day, (especially at work), learning to become a proficient list-maker may be just the rejuvenating aid your brain needs. So, in the name of lists, we present 5 helpful ways to use lists to get organized today. Science has proven time and again that writing goals and to-dos down on paper increases the likelihood of accomplishing those tasks. Many psychologists also say that having a list to prove what you've done can reduce anxiety and stress as well as give needed structure to a day. If you create a list you can create your "plan, do, review, improve, repeat" process. The first step is a list! 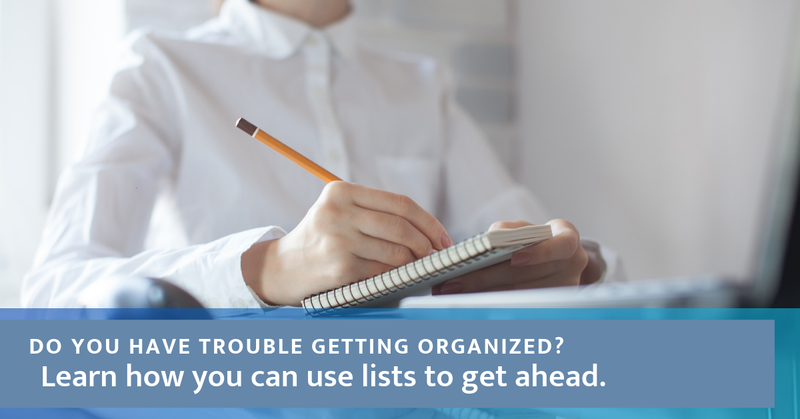 If you've avoided list making in the past, it could be because you hate that nagging feeling you experience at the end of the day when your list is still full of items left undone. Not to worry! This frustrating feeling can be eliminated by using the famous Seriousness, Urgency, Growth, (or "SUG), method of list making. This method works best if you use a spreadsheet so it can be easily sorted after you categorize the list. Start by listing all your to-do items in whatever order you come up with them along the left of your document. Then, add three columns at the top of your list with the titles "Seriousness," "Urgency," and "Growth." For each item you've listed along the left of your list, rank it under the three SUG titles. For example, say you have on your list the task "finish my taxes." You would then rank that task under "Seriousness" as either "high" or "medium." Under "Urgency," you would rank it "yes" or "no." Do the same under "Growth," ranking the task with a "yes," or "no," based on whether that task will get larger if left undone for a time. Breaking your list up this way will help you visualize which items need to be accomplished first. It will make it much simpler to decide what you must get done today and what can be left for a while without causing you to lose sleep (or in the case of our example, tax refunds). Sometimes our to-do lists consist of items related to long-term goals we have. But, when you have "be more active" on your to-do list along with other everyday items, it can become white noise. Just think about it, having a vague item of "be more active," along with "buy groceries," "kid's recital," and "finish work project," will never get you anywhere. It's much easier to head to the store and mark that item off your list. So, simplify the items on your to-do list that are actually long-term goals. Simply take that goal and break it up into more manageable, short-term tasks or action items. For example, if you are making a weekly to-do list, try including something like, "get to the gym 3 times." Having smaller and more specific tasks or action items on your list will bring you much closer to your long term goals. Plus, it will be much more satisfying to be able to cross those smaller tasks off each time you accomplish one instead of waiting for the final achievement of your goal. In the wise words of Bob Proctor, "Accountability is the glue that ties commitment to the result." If you're feeling unsure about whether you can actually accomplish your list or stick to your goals, share it with someone. Publish your list, post it on your wall, create a post on your social media platform, hang it on the fridge, whatever makes you feel comfortable. Making your list public will also make you feel accountable to others who see it, and make sure it gets done. While this idea may seem a bit intimidating, the Association for Talent Development conducted a study all about accountability and the resulting social "pressure" it creates. Pressure is not generally thought of as a positive thing. But when it comes to pushing yourself to accomplish your goals or complete important tasks, the ATD study discovered making yourself accountable increases your likelihood of accomplishing that thing by up to 95%. If that's not enough incentive to go public with your list, just think about the fun of having someone else to celebrate with you when you've finished it! Another simple way to get organized using lists is to break your to-do items up by category or time period. If you have multiple work meetings each day, group your attendance at each of these meetings into one category. Create a new category for listing every item you need to have accomplished for each meeting, or have ready to present at those meetings. If you're using the same materials or process, create a checklist so you miss anything for the next time you do this. Consider the category of time a yearly, monthly, weekly or daily checklist so you don't miss something important for that time period. These time period checklists are helpful for repeating tasks. Habits are powerful things. Lists based on time sensitive actions can be powerful. You can have a separate category for miscellaneous items to get done during the workday. Things like requesting time off from HR, sending emails, or getting lunch with a coworker. This old-school suggestion may seem simple, but the satisfaction that comes from checking off a box at the end of every task can sometimes be motivation enough to get things done. Having checkboxes to mark off after finishing a task lets you see what's finished, while still being able to see what was originally listed. Avoid the frustration of repeating tasks or losing track of what you have left to do because you've scratched through an item or erased it. If you're using an app to create or manage your lists, find one that lets you check completed items off somehow without erasing the items entirely. If checkboxes aren't your favorite, find another satisfying way of "marking items off" that are finished that doesn't entail removing them entirely from view. Try highlighting items that are finished. Color code your list with red ink for undone items, green for complete, and blue for items in the process of completion. Reviewing your list to see how to make it better is as important as creating it. You can use lists to get organized as well as a number of other efficiency tactics. For more ideas on how to manage your tasks and time effectively, check out our post on productivity tips. We've got helpful tips on everything from time management, de-stressing, organizing your workspace, and more.